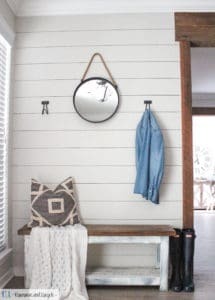 Weathered, rustic, barn wood, antique, white wash; these are all popular finishes that you’ve probably heard of! If you haven’t heard of them you must be living in a box. LOL. 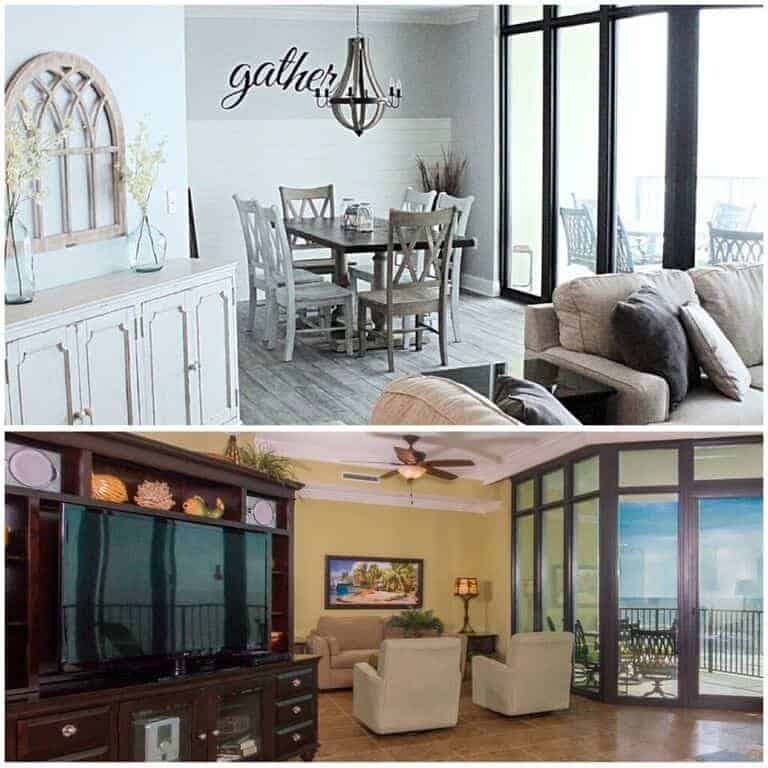 Even looking around at new furniture stores, most of the furniture has a faux worn look. This trend has been around a while, and I think it’s here to stay a little bit longer. 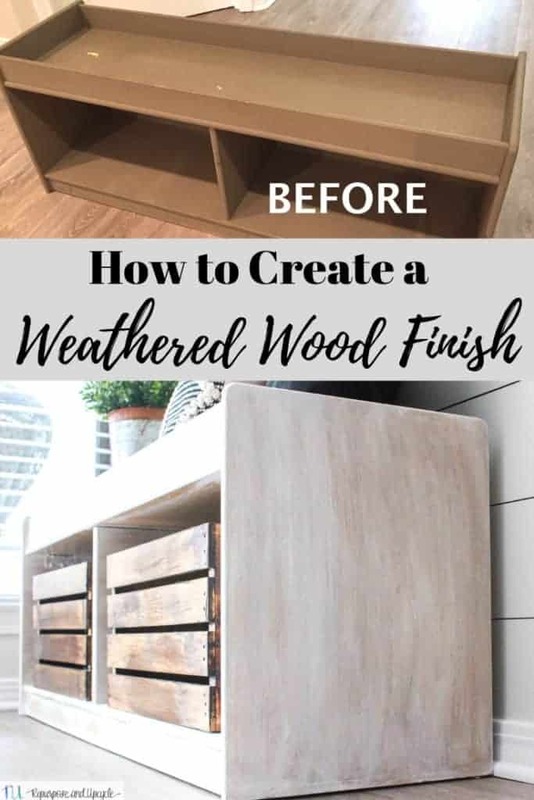 When I was deciding how to makeover my entryway bench (which is a smooth laminate surface) I decided to give it a weathered wood finish with dark wax. 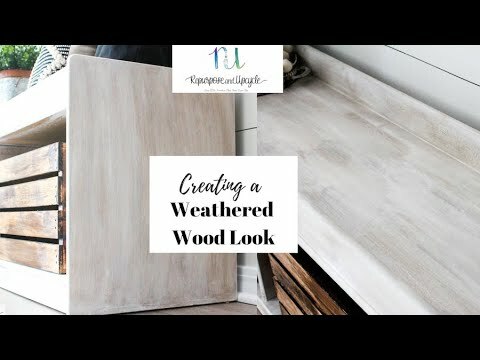 I’m going to show you how I created it with a quick video. I really wrestled over what finish to give this very smooth surface. 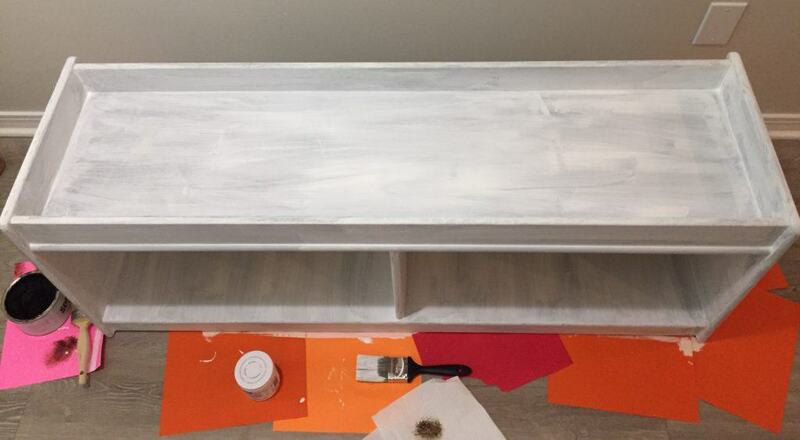 Also, it had a previous paint job (very poor paint job) of medium gray chalk paint. 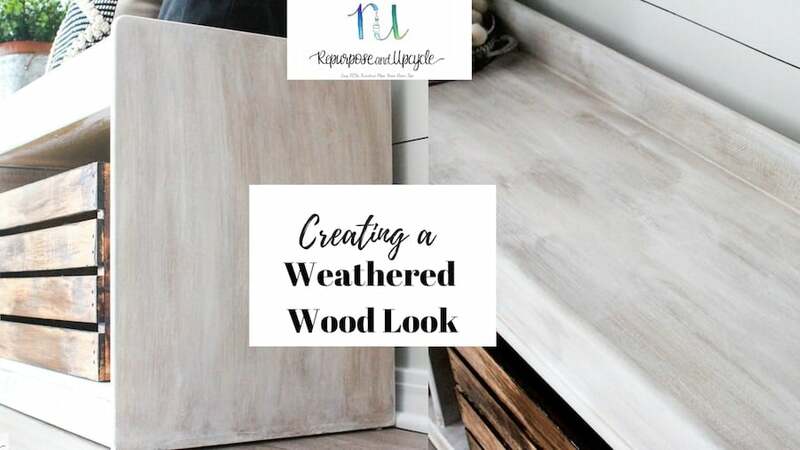 How do you give a weathered wood finish to a smooth surface? 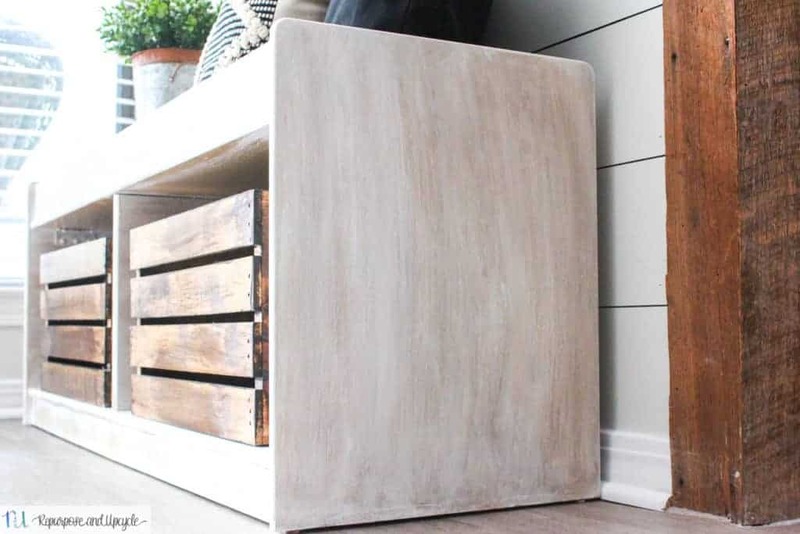 My easiest solution to create a weathered wood finish is to paint the entire surface with white chalk paint and then “distress” it with dark wax. Here she is in all her original glory! Yuck. 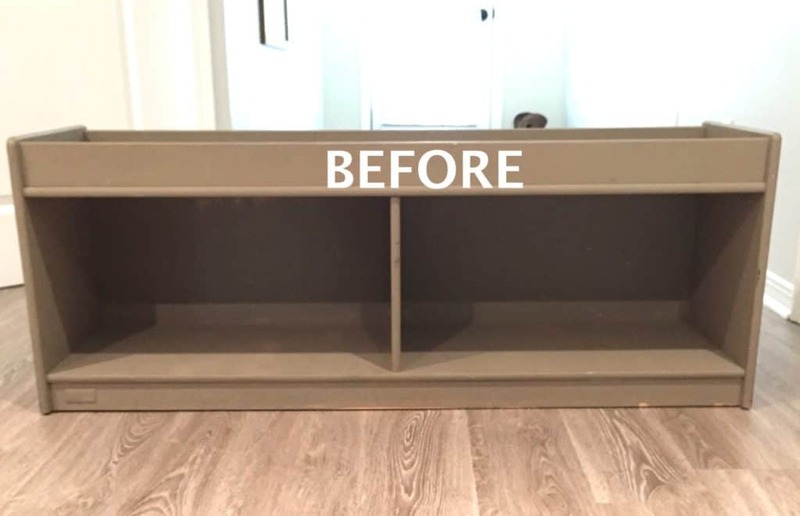 At one time this bench served a good purpose in my kids playroom, but it was time to give it new life! This post contains affiliate links. This means that if you purchase from one of these links I will receive a small commission, but rest assured you won’t pay anymore for the product. Thank you for supporting my blog! 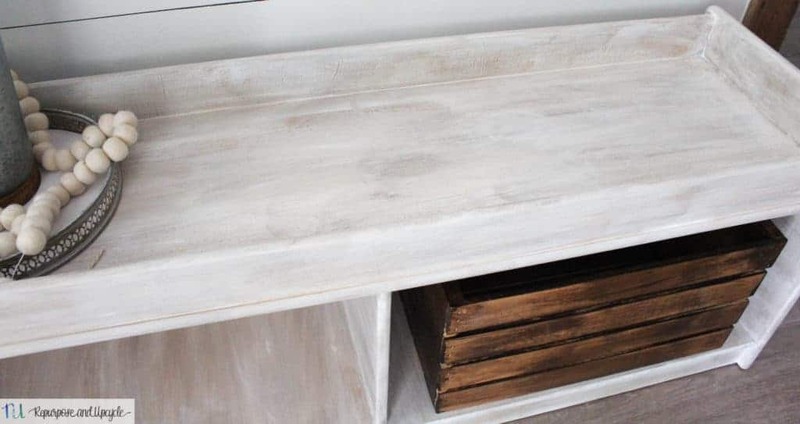 Next, grab your white paint and cover the entire piece with a coat of white paint. 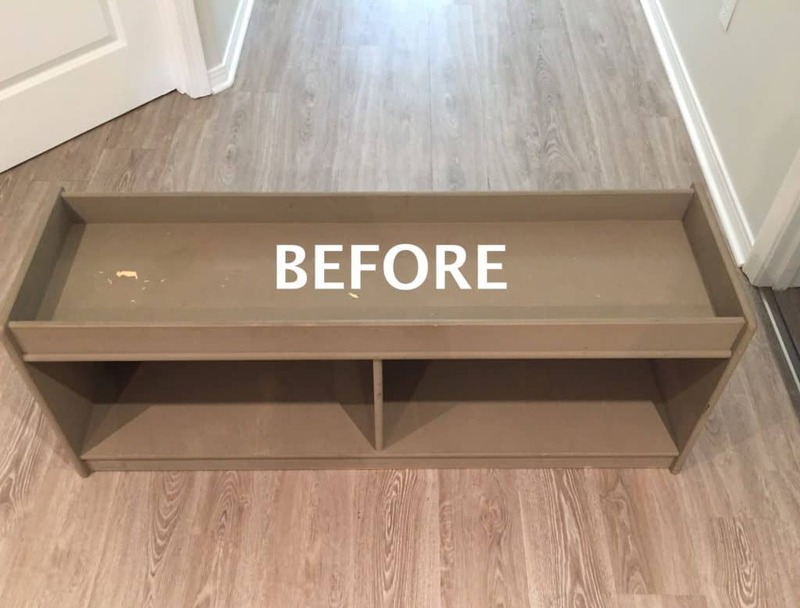 You don’t have to use a white paint, it can be a light brown or light gray. 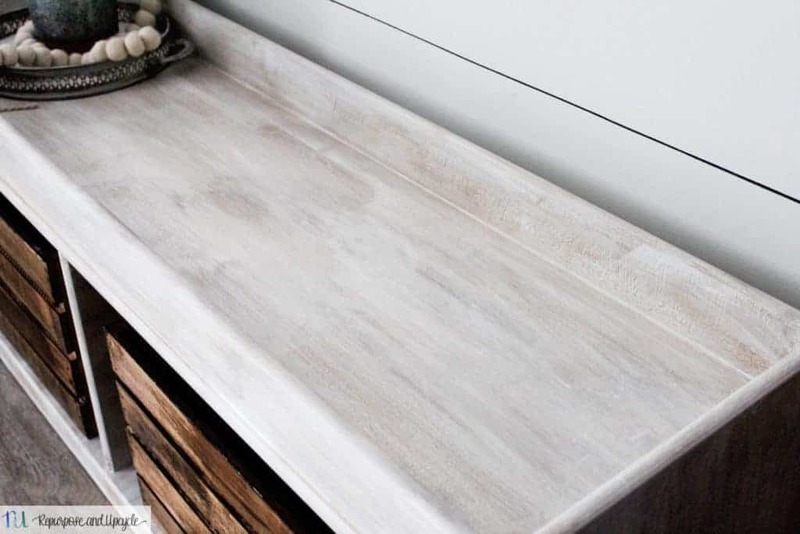 Actually, the light gray creates a more “realistic” weathered wood look. 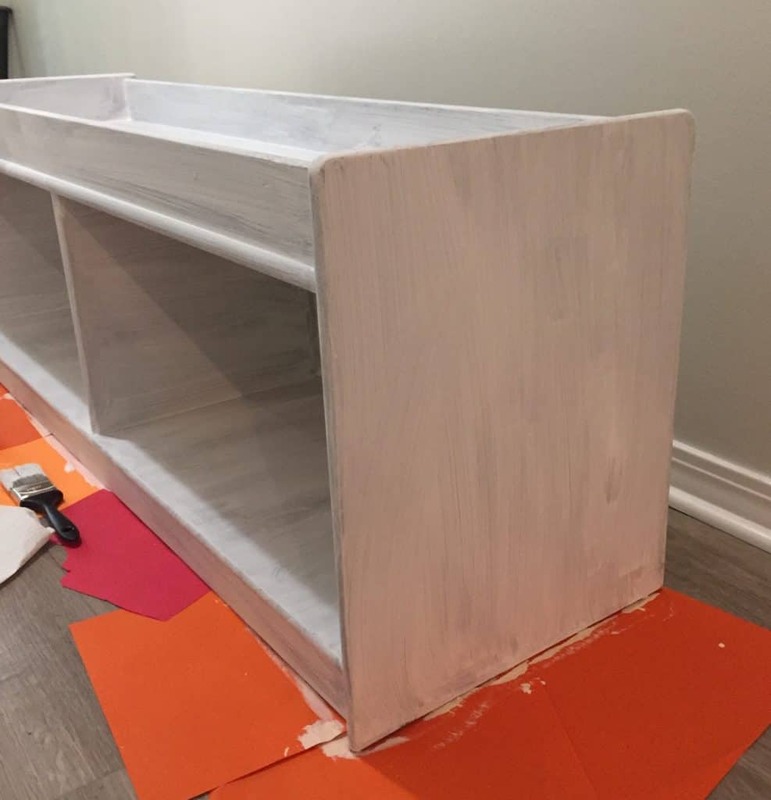 I wanted the finish to be very light, that’s why I chose the white. 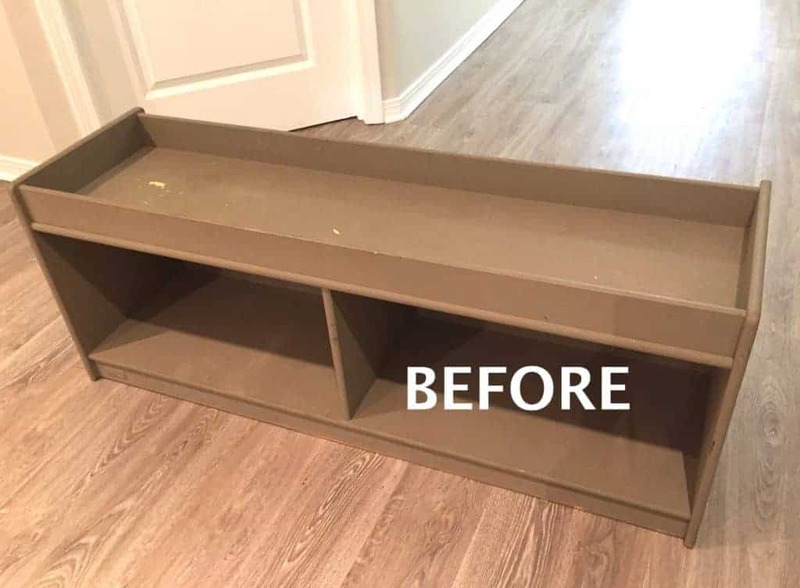 You can choose to add a second coat of paint, but I decided to leave just one coat. 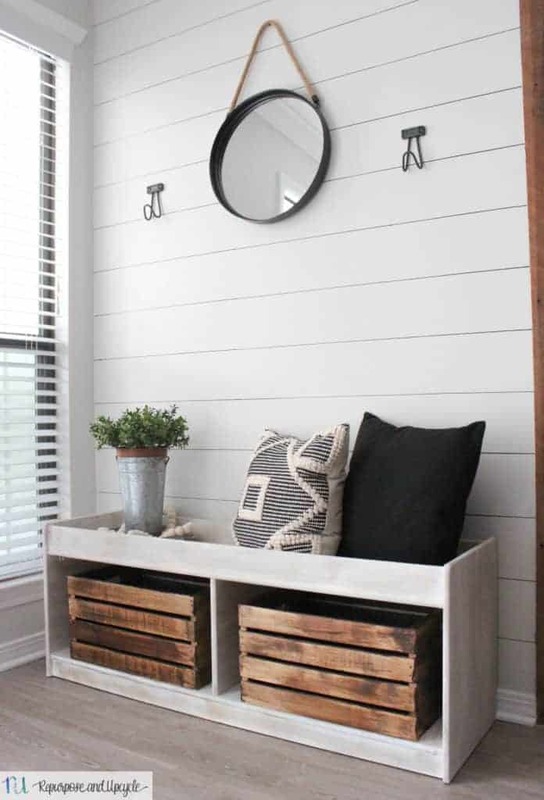 I felt like this would create a more “rustic” look. After the paint is dry, next comes the dark wax. I’ve detailed the entire process in a video. Rather than typing it out, I figured a video would be better. 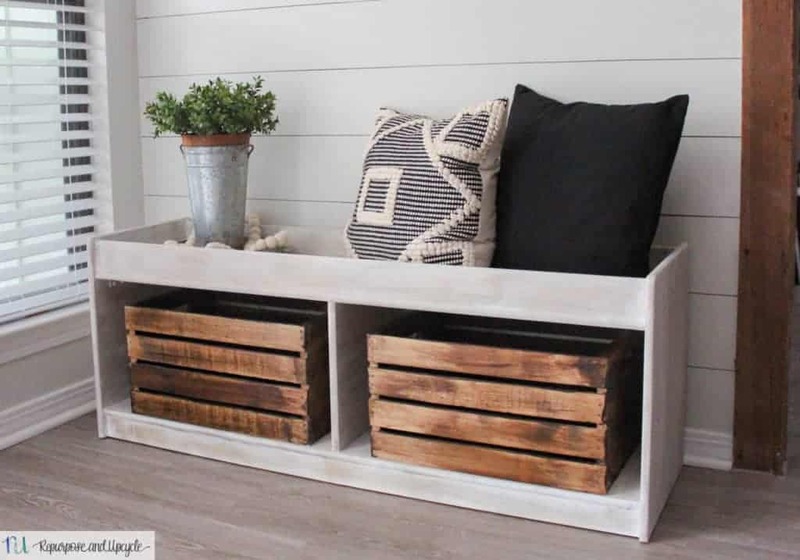 I’m really pleased with how my DIY weathered wood bench turned out. As always, thanks for stopping by to see what kind of DIY shenanigans I’ve been up to. 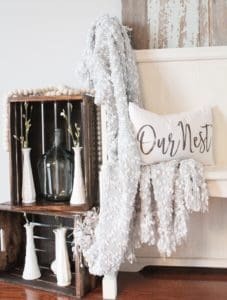 If you liked this post I would love for you to pin the image above to Pinterest. 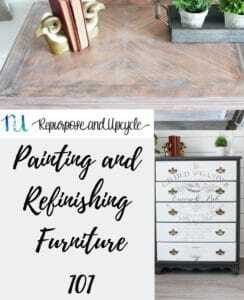 You might also be interested in my Painting and Furniture Refinishing Category. I love the new look! Nice job!